This has been a long time coming. So much for my New Year's resolution to get a new episode of AiV up every month. But this is a special treat: back to back episodes featuring the same album. Well, not exactly the same. 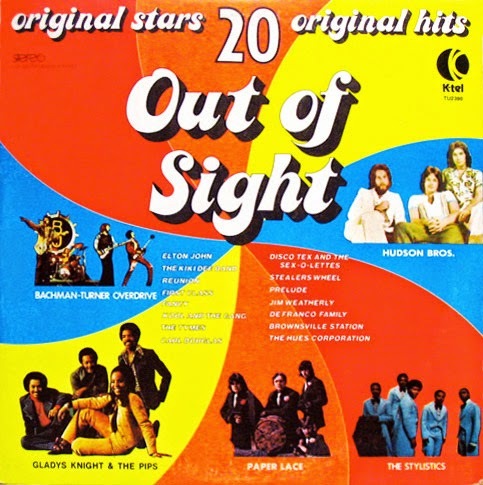 K-Tel often released different versions of the same titled album in different territories. The album may have looked the same, but the contents were often very different. 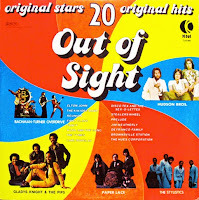 Case in Point: Out of Sight from 1975. On this episode of Adventures in Vinyl, we will are spinning the American version of the album. Next month, we'll listen to the Canadian version. Back to back K-tel. As usual, this episode features news, music and movies from 1975. New episodes of Adventures in Vinyl stream at 12:30 pm, Saturday and 4:30 pm on Sunday and 2:00 am on Wednesday. Also, past episodes are heard on Vinyl Voyage on Tuesday at 1:00 pm, and Thursday at 10:00am. You can also listen to these episodes anytime you want. All 33 episodes are archived at Mixcloud. The new episode is embedded below.